players go thru the wormholes in groups, to quest. you can visit an unlimited number of worlds in the horizontal level. you can explore and establish trade, or join raiding parties and wreak havok, or anything you like. you learn different physics skills on every world and practice communicating thru the wormholes, including quantum tunneling, clairvoyance, and action at a distance. one of the skills you learn is the ability to tweak the game conditions in that world. starting at the horizontal level it’s possible to take over and remake a world your way, changing the rules and resetting the quests. a world so altered becomes a new world, with you as god, taking its place in the multiverse of the horizontal level. like other worlds, it is accessible from level 4, and can be cross-linked to other worlds by the players. eventually you get stranded in an alternative antarctica when your wormhole closes unexpectedly. 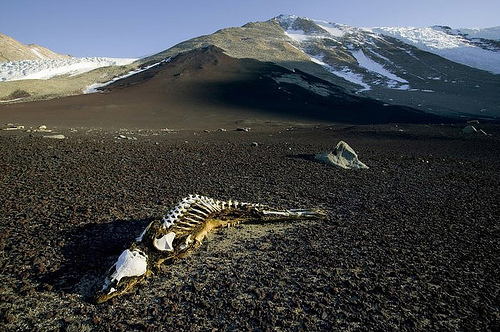 in this antarctica, the ice has recently melted away and a vast and varied land has emerged. you can go where you want in this new land, and do what you like using your many skills, and there are special challenges you must pass before you exit the level. gameplay is difficult and strenuous, and you must solve problems using quantum tools and working with others to overcome obstacles. faster and more complete change is possible when players build cross-challenge alliances. you wake in a crude stone shelter wrapped in seal skins. strange players tend your scrapes, congratulate you on making it to shore alive, and fill you in on where you are and what’s going on. you’re in an ex glacial valley full of barren rock. a stream trickles down the middle, all that is left of a mile high river of ice. there might still be a glacier or two far inland. a few tufts of grass grow in sheltered areas. penguins nest here, and seals, and there is plentiful fish. there are a few other players; they seem to have come here as refugees from the harsh northlands, seeking survival and a better life. conditions are harsh, there are frequent storms, there isn’t enough to eat, it is cold and dark for six months of the year, and life is short and brutal. it’s the garden spot of the planet at the moment, however, so you get to work making your living. the grind is survival – hunting and fishing, making things grow. but hunting and fishing are not firstperson shooter skills. in antarctica, the skills you learn are cooperative and quantum. there is always someone who will trade you something you desperately need for anything you have, no matter how pitiful, but you will make a better trade if you are honest and generous. you can trap and kill to find your food, but you will get better quality food if you negotiate with the animals. you can plant seeds if you can find any, but you will get better results if you work to improve the land and coax the fairies to grow things. you can erect massive walls against the storms, but you’ll get better results if you talk to the wind and ask it to go easy on your shelter. your task is to cooperate with everybody, to learn strength in numbers, and to use your quantum skills to help terraform antarctica. as you practice your skills you gain the power to change the climate, the ocean’s circulation, even the tilt of the poles to bring antarctica to a more temperate latitude. you can leave at any time, and are free to behave any way you want. there are opportunities to cheat and steal if you like, but in this environment the victim usually dies. evil vampire aliens have almost captured the planet and they have to be found and fought wherever they appear in antarctica. the grind is searching and finding clues. finding them takes you all over, gives you essential knowledge about the way things are, and teach you about hunches and intuition. you learn visualization and extrasensory communications skills, as well as the use of force fields and psychic weapons. captured aliens reveal vital information about their mission without being waterboarded, but you can torture them if you want to. in a vast gray city there is a vast gray corporation where you are a droid. based on a short interview you are assigned a job title and duties, and are expected to give 110% to the job. the grind is makework. you have bills to pay and mouths to feed at home, and you’re in the hole with all kinds of credit card debt. the wolf is constantly at your door, but you have friends and family who help you find solutions to your problems, and get back at your employers – evil vampire aliens. your quest is to find ways of getting all your work done and still have time to enjoy yourself. you are caught in a bleak totalitarian society where the hopeful thing to do is die, but you keep incarnating again in equally bad situations. the evil vampire aliens run everything to benefit themselves, and have so oppressed the people that the death rate is enormous. your grind is to find something to eat and stay away from the forces of evil. you starve to death, are beaten and stabbed and robbed and shot and run over and exploded by practically everybody you meet. teams of riot police with tanks and grenades mow down desperate starving masses in the squares, and players cower in their homes in fear of being turned in to the secret police. your only hope is to join the resistance and defeat the aliens. you learn all about urban nonviolence and the techniques of social movements. you join different workgroups and help create alternative food supply chains, healthcare, education, a new money supply and economics based on a horizontal structure. your challenge is to help recreate society and destroy the power of the evil vampire aliens. as the level begins, you are drifting on the southern ocean. it’s very cold, and you are thankful there’s no wind – it’s as calm as glass thru the drake passage. and this is good because you are adrift on a tiny, leaky raft, with only a few provisions. among the most helpful are a blanket and a stick. it is summer, and the sky stays light all evening. eventually – you’re not sure – but you think you see land far to the south, so you head that way. seabirds appear and follow your raft. so do sharks. as you approach land, the wind picks up, the waves grow rough, and you try to outrun a storm blowing from the west. but your raft breaks apart – too far from shore to swim. the water is cold, and you quickly lose command of your arms and legs, but a passing seal notices you and shepherds you to shore – mostly dead. Posted on December 5, 2011, in antarctica, game, occupy, plot, quantum. Bookmark the permalink. Leave a comment.